The Reporting Overview gives you insight into how Zendesk Support is performing. It provides data about your ticket volume and management. It also enables you to compare key ticket metrics within Zendesk Support, and with your peers. The Reporting Overview displays data in the timezone settings configured in the user's profile. Note: The Reporting Overview is not updated in real time. Except for Satisfaction data, which is updated daily, the data in the Reporting Overview is updated hourly. 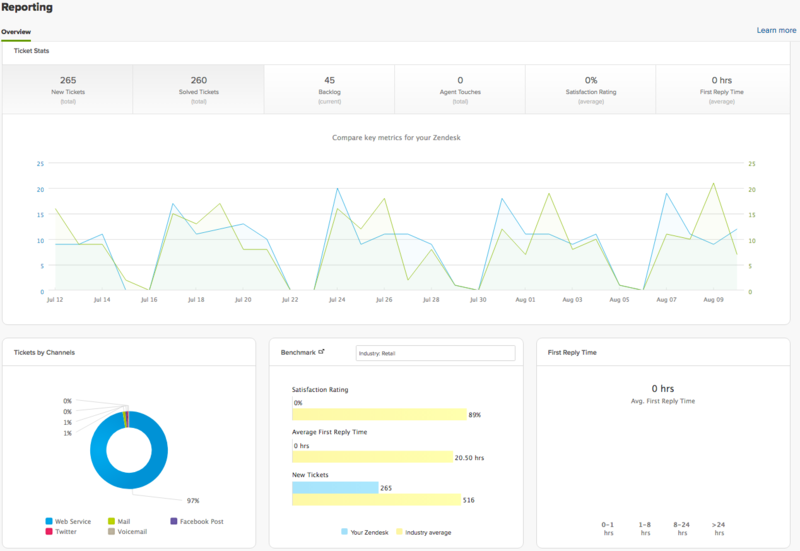 The Reporting overview contains three sections for comparing key ticket metrics; viewing ticket metrics by channel, benchmark, and first reply; and viewing top articles, searches, and agents. Note: Agents must have access to all tickets in order to use The Reporting tab. Click the Reporting icon ( ) in the sidebar. The Reporting Overview opens by default. Select a Reporting period at the top. You can select a predefined period or select Custom to set a specific range up to three months. The custom date range is inclusive of both dates selected. The dates selected will include dates that are greater than or equal to the start date selected and less than or equal to the end date selected. Analyze the data that appears in the Overview tab. 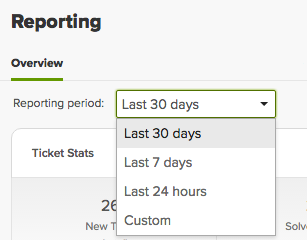 The top of the Reporting Overview contains options for viewing ticket metrics. Note: The ticket data in the Reporting overview includes any deleted tickets. If you use Insights (Professional and Enterprise), deleted tickets are automatically excluded. New Tickets is the number of new tickets created during the reporting period. Solved Tickets is the number of solved tickets during the reporting period. Backlog is the total number of unsolved tickets in Zendesk Support at the present time. Agent Touches is number of agent updates to tickets during the reporting period. Satisfaction Rating is the average customer satisfaction rating given during the reporting period. First Reply Time is the average amount of time it took an agent to make the first public comment in a ticket (in calendar hours). When you click one of the ticket stat options, you see a detailed graph that includes daily totals for each day of the reporting period. You can change the reporting period for any of the ticket stats. And you can view one ticket stat at a time or you can choose to compare two ticket stats. You can chose a predefined period or chose Custom to set a specific range up to three months. Click one of the ticket stats at the top to view that data. If you want to compare two stats, click a second ticket stat. Hover your mouse over the graph to see daily totals. The middle section of the Reporting Overview contains three panels for viewing additional ticket metrics. Tickets by Channel shows the percentage of your tickets that come from each of your supported channels. The graph shows a maximum of six channels. If you offer more than six support channels, you will see your five most used channels and a sixth category called Other that groups your remaining channels. Benchmark enables you to compare your key metrics to your peers. The benchmark shows your satisfaction rating, first reply time, and new ticket volume compared to your peers, by industry, company size, or target audience. The benchmark is based on a 28-day rolling window of performance benchmarks for you to compare yourself against. The benchmark is calculated by first finding the mean (or average) for each individual Zendesk account, then taking the median over all accounts as the benchmark. By this definition, 50% of the accounts in the segment fall above that number, and 50% of the accounts in that segment fall below that number. First Reply Time shows the average amount of time it took an agent to make the first public comment after a ticket was created. The chart shows the distribution of tickets according to number of hours for first reply. This enables you to visualize the first reply time in a more robust way, rather than looking at an average, which might be skewed by outliers. If an agent creates a ticket, it will not automatically be excluded from First Reply Time on the native overview. The first reply time for an agent-created ticket will not be calculated until any agent's next public reply. The graph includes a breakdown by hours, showing what percentage of tickets were responded to within a specific number of hours (0-1, 1-8, 8-24, or >24). Tickets that do not have a public comment are not included. For example, if a ticket is closed without a public comment, it does not have a first response time, and is not included in the First Reply Time calculation. Note: This metric is based off calendar hours, not any business hours or schedules you might have set. You can choose a predefined period or chose Custom to set a specific range up to three months. Note: If the Benchmark report does not display data, you need to complete a brief survey to opt-in to the benchmark. To do so, click the Admin icon ( ) in the sidebar, then select Settings > Benchmark survey. It might take some time for your Benchmark report to update. You can also watch this short video about how to complete the benchmark survey for your Zendesk. The bottom section of the Reporting Overview contains three panels for viewing data about your Help Center content, end-user searches, and agent performance. Help Center content shows your top articles or posts according to the number of views, votes, or comments during the reporting period. You can filter for knowledge base content or community content. Top Searches shows end-user search data during the reporting period, including top search strings used in your Help Center, searches that resulted in a user creating a ticket, and searches that did not return an article or a community post. Top Agents shows your top agents according to number of tickets solved, customer satisfaction ratings, and number of ticket updates during the reporting period. Note: The Top Agents panel is not displayed if you are using Support Essential. Refer to the reporting panels at the bottom of the Overview: Top Articles, Top Searches, or Top Agents. Click any of the tabs in the panels to change the data. (Professional and Enterprise only) Click See all at the bottom of the panel to expand the data. Clicking See all opens the Knowledge Base, Community, or Search Reporting tab, depending on your selection. For more information on Help Center reporting, see Analyzing Help Center knowledge base and community activity and Analyzing Help Center search results. I want to know search behavior for the Knowledge Base.I select Search, Brand, Help Center, and date. I get data such as # of total searches, # with no result, # with no clicks, and # tickets created. I want to know the specific keywords or strings associated with the search. I see in the documentation those appear. They do no appear on my screen. How can I see this data? We switched over from Desk.com a little while ago. Basically the only analytics they reported were how many tickets were solved by each agent by channel and when. And that is all the info I really cared about. Now that I'm with Zendesk, that is pretty much the only stat you DON"T include. Is there a way to custom set it up? I can't figure out a way. Can someone help please? Filter - Month/Year (Event) is a floating range. Take a look on this short Demo. Fore more information regarding Insights functionality please refer to our documentation: Insights resources. It would help to know what search terms are being used often in the Help Center as native metrics in Zendesk (not going to Google Analytics). I am noticing a pattern of less-than-helpful metrics in the ZD reports. per Brand like I can in the Knowledge base tab. (see below). Is there a way I can do that? So I'd like to know volume of new tickets for each brand. In general, it would be incredibly useful to be able to break down all the Overview metrics by Brand - otherwise we can't can't compare apples with apples. Why is this only possible for the knowledge base? Thanks for the response, Eugene. We're on the Professional plan, but our agents need to see all tickets, so this isn't going to work for us. But I appreciate it. Those are in direct relation to your industry, audience, and company size that you selected in the Benchmark Survey under Admin > Settings > Benchmark Survey. Based on the your selections, it gives reflects those options in the drop-down to compare your account to similarly-sized companies. Currently, after filling out the survey, those are the only options available in that section of the Reporting Overview! Thank you for commenting and reaching out! Let us know if you have any further questions! Can someone provide a more granular definition of "Touches" as displayed on these reports? Does it include all updates to a ticket? Or only updates w/ comments? If I just flip the status between open and pending 5 times in succession, without making any other changes to the ticket, does that register as 5 touches? Unfortunately it's not possible to modify these reports in a way that will show you only the results related to one individual Organization. These are just meant to give you a broad breakdown of your account activity. For the sort of functionality you're wanting, you'll need to use the Insights reporting platform that's available on the Professional and Enterprise plan levels. I hope that helps clear things up! Need help sending a daily ticket reports to End User, GoodData will accept Light Agent and Agent email but not accepting End User email address. Please help by providing instructions. The calculation for "Agent Touches" is the sum of all ticket updates made by agents for the specified period of time. How do i share leaderboard information with non admin agents ? I do want to clarify, do you have Chat enabled in your Web Widget? If your Web Widget allows your user to submit a request, search your Help Center, OR have a live chat with one of your Agents, then Chat is enabled there. Even if the Chat is initiated through the Web Widget, it will be counted as coming in via the Chat channel. Hopefully that clears it up for you! Web Form refers to any ticket that is created either via the Submit A Request form in your Help Center, or by an Agent in the Agent Interface. We have a complete list of channel definitions here that gives additional information as well! Annoyingly, GoodData can only send reports as e-mail to registered real users of Zendesk (and end users don't count.) Luckily, you can send Dashboards via e-mail (only as attached PDFs, unfortunately) using Zendesk Insights to any e-mail address. Hi All! How can I calculate the response rate by priority which is based on the ticket and not per instance? So far I have tried counting tickets created where First reply time in mins is less than 120. I need to add a condition where Priority is Urgent but the editor doesn't accept it. select # tickets created where first reply time in minutes >= 240 and first reply time in minutes < 480 and priority = "urgent"
If I am able to get this count, I can divide this to the total tickets created to get the response rate for urgent. I believe this article will point you in the right direction but if it's not what you're looking for, scroll to the bottom of the page and submit a request! This is a common issue when creating custom metrics. You cannot just type the names and values of elements such as 'priority' and 'urgent'. Here is an extract from the GoodData documentation. While MAQL syntax can typically be typed directly into the Metric Editor text field, project elements like facts, metrics, attributes, attribute values, and variables must be added to metric definitions using the Project Element Sidebar. I need the Benchmark Report with a longer time frame, 90 days is to short. How can i find/create this report with Insights ? We are actually experiencing the same issue that Rebecca reported in Jan 2017. I can see the number of 'Search With No Results Found' but I can no longer see the search term strings. This is a recent occurrence as we always used to be able to see this data. Could you please open a ticket to investigate further? Can you see which times are most popular to receive tickets based on metrics? So, four years ago folks asked for the ability to filter reporting based on Group and/or Organization and as far as I can see this still hasn't been implemented? Is there a way to export the daily details into a spreadsheet? But I wanted to know that Is there is any APIs to get tickets by channels(for pie chart data) if yes than could you provide me that link. Can I see in reporting tool issues by category and by customer? Like in a pareto?Thanks! If you're on the Professional or Enterprise plan and are using Insights for your reporting, you have this capability which you can read about here: Insights object reference (Professional and Enterprise). If you're using the Native Reporting in Zendesk, you can filter your Leaderboard by Agent or Group, and you can create new reports using Groups or Organizations as a condition. I tried to upload the excel file several times, but always show that error message my format is correct. This is the first time I encountered this problem. Unfortunately, such functionality is not available at the moment. Unfortunately our Native reporting overview would not allow you to report on just data for tickets Monday through Friday. However, if you were to leverage Insights and Business Hours, you could achieve this workflow. Feel free to send us an email at support@zendesk.com if you'd like to discuss this in more detail. I think second option is a better answer for my query. But on this way I need to calculate tickets percentage with respect of channels. By the way I already found this API but I was expecting that we have APIs on report section, So I can use it on my own way.